In The Oblivion Bar, a man calling himself Arion hits on Traci Thirteen and her friend. In the background, Manitou Raven communes with his widow. Outside, rebuked, the man calling himself Arion encounters the real Arion, who appears in giant head form and taunts him. Superman returns to Metropolis, only to find the Young Gods flying about, causing trouble. Superman starts to corral them, but Lightray appears and tells Superman to take the night off to solve the pressing issue that's bothering him (Arion's portent of disaster). The "fake" Arion, held by the "real" Arion debates his own worth, having helped save the world back during the day of vengeance. The "real" Arion indicates that perhaps the imposter can be of some use. As Superman talks with Lightray, some of his charges approach, holding baby Chemos. Superman turns to take care of the problem, but Lightray insists, given how weighed down Superman's spirit is, that he take the night off and consider things. At Lexcorp, Superman talks with Lana about how Lexcorp is tanking. She advises Superman that if he plans on quitting, he should give to the world in scientific ways, like exploring the oceans or space, but urges him not to quit. Superman talks with Lois, who tells him to tell Arion to go scratch. She sends him off to think alone, which he does, on the moon, staring down. As he returns at daylight, he saves a kid falling off a building, and finds that Lightray has set everything to right. Arion confronts Superman, and when Superman has resolved not to quit, Arion casts a spell on him to take over his mind, which begins taking effect. Story - 1: I tried to like this one, I did, but I couldn't. There were some really great ideas and moments. Lightray before his death (which was poorly done in my opinion in Countdown), little Chemos (nice concept). And even though I STILL get chills at night thinking of the "Abra-kadizzle, that's street magic, yo!" cliché-ridden "urban" reveal of Traci Thirteen, it's neat to see her as a random background character. That takes some forethought, as opposed to just having two girls in a bar getting hit on randomly by Arion. Manitou being around was also a neat touch. Great little geek moments there. But then there's the story, and that's what the rating is really about. The Young Gods come to town. Okay. Who are they? What do they do? Why are they there? What's their motivation? How is it resolved? If you're going to spend nine pages on their antics, how about one line explaining who they are? Let me put it this way. I've read the New Gods trade. I'm a fan of Kirby. 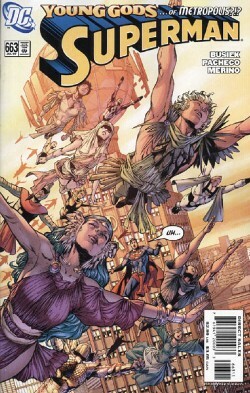 I am moderately familiar with the New Gods, but I had no idea what the hell was going on, beyond the fact that Lightray is apparently in charge of these kids, they're flying around raising cain, and nobody's stopping them. As a subplot, they remain unresolved save in the most general of fashions. And again, I ask, why the Young Gods when we could be dealing with someone more Superman focused? A known rogue? Where have they gone? The book seems to be "Arion and Lightray," guest starring Superman. Superman's personal focus on his own dilemma is approximately five and a half pages of the script. Granted, in some of the pages with Lightray and the last few with Arion, the dilemma is mentioned in passing (the overarching plot) and in advisement, but all in all, Superman is not confronting the conflict he's supposed to confront in a 22 page comic for more than 10 of its pages. The rest is indulgent, tangential meandering around characters that, if one is to tangentially meander with them, should be done in a special, their own book, a crossover, or anywhere with a book that doesn't say SUPERMAN in big letters, unless Superman is a key part of that tangential meandering. Here he's not at all. Point of fact, Lightray makes a huge point of indicating that Superman doesn't even have to be there. Bad move. Arion confronting the other Arion had nothing to do with Superman's conflict. Nor did most of the Young God cavorting (beyond bringing attention to the HUGE COMPANY PROJECT going on in the background and pimping Lightray). The "Arion" dilemma is present in approximately half of those pages. Beyond that, said dilemma is resolved rather arbitrarily in the space of one page, where Superman stares at the Earth from the moon. There's no catalyst, no turning point. It's de facto characterization. Superman decided to do the right thing because that's just what Superman does! Well, okay, then if so, why did he even ponder it so deeply in the first place. If you use the de facto, you can't have Superman considering it, and if you don't have Superman considering it, then the last three issues of him doing so are senseless. In other words, why spend ten pages on Lightray that could otherwise explain, through extrapolatory dialogue, metaphorical encounter, or anything, anything, ANYTHING that reflects on the dilemma at hand, why Superman chose to stand his ground? The closest we get is Superman saving the falling child, and using that as a relational. He then uses it to drag forth his logic. He'd rather save one person and let ten die, if he could save that one person first, because it feels like the right thing to do. In other words, not logic, emotion. It's hardly pragmatic, and I don't necessarily buy it. Otherwise, why would Superman kill Imperiex? It's killing one to later save billions. Beyond that simple contradiction, assume that this is his philosophy. Why does saving one child make him suddenly aware of that, as if he hasn't been motivated by this for years? My personal take is that if someone showed Superman an alternate future where he was responsible for the end of existence (particularly one in which he's already seen the optimistic future of the Legion), he'd tell them to jump in a lake, he's frickin' Superman. If said person persisted in asking why, he'd show the results of his good deeds, and point out all the times he's beaten unassailable odds. Yeah, after what, six issues of belaboring said point? Part of what makes Superman so great is he doesn't HAVE to belabor such points. We do that kind of thing, Superman just innately knows (because of his philosophical pragmatism, noted in the last Action issue). So then, Arion decides to make Superman his personal slave? Ah-wha? Going from altruistic desire to let Superman live in peace with himself to a megalomaniacal control freak with a mind control streak? So much for the build-up of his character. Clark speaks to Lana, and Lois, for a page apiece. Lightray tells him to take it easy. But that doesn't really add up to enough motivation, not even with the kid. Not to my reading. Not if you've distracted Superman so much he'll abandon his city to Gods. Arion berates the imposter Arion, which is cute, but what does it add to the story? What do mischievous Young Gods add to the story? This isn't like Metallo appearing without a motivation, which can be cool because he's a classic Superman villain that fans welcome back. This is an obscure set of characters who are very random. Beyond the simple construction stuff that bugged me, there's the usual niggling stuff that, when coupled with a dissatisfactory plot yield agitation. Superman is whining again, and takes a night off while hooligans vandalize his city to lament it. Granted, for a full page on the moon, but the principle remains the same. By its own text, "the light within" Supes is muted, weighed down by a darkness in his heart and his thoughts. Cry more, emo. "Day of Vengeance" referred to by name, despite the fact that it's not done so commonly in the comic lore that I know of. Like Jimmy knowing who Jason Todd is, or people referring to the "first crisis." Meta-gaming. Lana is still the CEO of Lexcorp, though we don't know where she got any business acumen, at all, or why she would be chosen of all people. She also still pines for Clark, despite having a kid (Is that so, anymore?) and living in Metropolis where he already has a wife, a concept I believe that has already been addressed and resolved at least twice in the last twenty years. Beyond that, Lana suggesting that Superman would ever quit for anything shows a remarkable naivety of assessment in her character, a quality notably absent in most CEOs of the second most powerful corporation in existence (next to Waynetech). Art - 4: The art is pretty nice, particularly in the perspective arena. There are a few places, like the giant Arion head, that remind me a bit of Romita, but for the most part It stands on its own. The perspectives are pretty incredible, actually, as are the creations of the multitudinous Young Gods. If anything is an argument for the tangent this issue takes, it's the artist's work on it. The work doesn't stand out in every panel, you don't notice it often, like a good special effect, but when it's there, it's really there. Cover Art - 5: I've gotta five it, if not for the perspective and the oddly placed but working background focal point, simply for the symbolic representation of the story, as I mentioned above. However, for the love of all that is holy, when will DC realize that these schlocky, words-on-the-cover issues are failing miserably. If it hadn't been for the symbolism I mentioned, those words would drop this an easy point. It's a huge blemish on this otherwise fine piece of art. Save the story dialogue for where it belongs. INSIDE. This isn't a subtle cue from an editor to spur on the writer, we're beyond that now. We don't need the story cue on the outside beyond the saleable image.